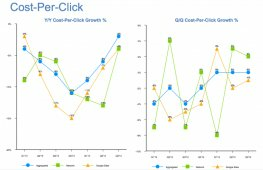 Earlier this week, comScore released its January 2008 qSearch paid click report, which showed a 7% sequential decline vs. December ‘07, and a flat annual growth in paid clicks for Google. Moreover, the number of paid clicks per Google search query declined by 8% from December to January, suggesting that consumers are clicking less on search ads, possibly reflecting a weaker buying appetite. The information triggered a flurry of reactions in the media and the financial community that centered on two concerns: 1) a potentially weak first quarter outlook for Google, and 2) an indication that a soft U.S. economy is beginning to drag down the online advertising market. While we do not claim that these concerns are unwarranted, we believe a careful analysis of our search data does not lend them direct support. More specifically, the evidence suggests that the softness in Google’s paid click metrics is primarily a result of Google’s own quality initiatives that result in a reduction in the number of paid listings and, therefore, the opportunity for paid clicks to occur. In addition, the reduction in the incidence of paid listings existed progressively throughout 2007 and was successfully offset by improved revenue per click. It is entirely possible, if not likely, that the improved revenue yield will continue to deliver strong revenue growth in the first quarter. Separately, there is no evidence of a slowdown in consumers clicking on paid search ads for rest of the US search market, which comprises 40% of all searches. The most puzzling data element is that Google’s U.S. paid clicks dropped sequentially by 7%, while, at the same time, its total number of search queries grew by 9%. At the same time, Google’s market share of all search queries grew slightly from December, and its annual query growth remains very strong. All indicators point to the company continuing to do very well as far as consumer usage and competitive position. The drop in paid clicks becomes even more puzzling when it is normalized on a per query basis: The number of paid clicks per search query drops by 16% in one month! The corresponding metric for the rest of the market drops by 4%. What accounts for this dramatic difference? We must remember that a paid click does not happen on a search results page unless there is an ad on that page. Since not all pages have ads on them, it is important to look at an ad coverage index, defined as the percent of all queries that have at least one paid ad. This index dropped by 8% for Google, going from 52% to 48%. In addition, even when a query result page contained at least one paid ad link, the paid click rate, defined as the average number of clicks per such an ad supported query, declined by another 8%, going from .24 to .22. Figure 1 shows the trend in these two metrics over a one year period. The graph illustrates two time periods where both measures declined together: first from January ‘07 to May ‘07, and then from December ‘07 to January ‘08. The remainder of the year was essentially flat. Evidently, January ‘08 is not the first time this decline has happened. The compounded impact on paid clicks per search query (whether or not ad supported) for the entire year, is a whopping 33% decline in 2007. The decline in the first half of 2007 clearly cannot be traced to a weak economy. And, despite this decline, Google managed to grow its worldwide search revenue by 68% in 2007. (The company does not separately report U.S. search revenues.) The revenue growth was achieved through a 21% increase in revenue per paid click.